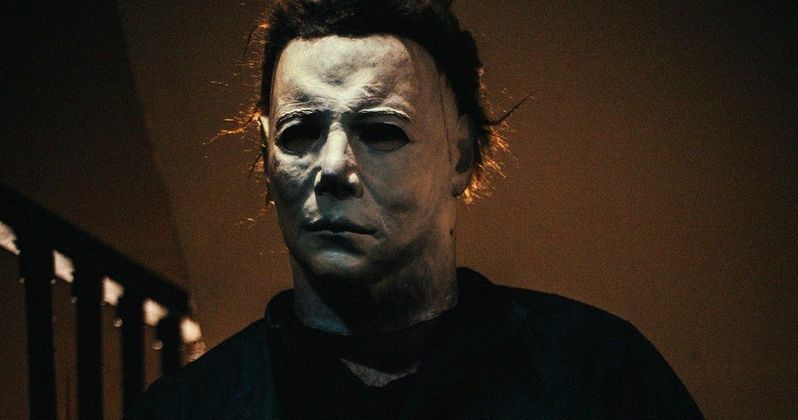 In last year's Halloween movie from director David Gordon Green, Michael Myers is arguably more brutal than he's ever been before. After his escape from custody, Michael turns an unfortunate young boy into one of his first victims in the movie. With no particular target chosen, Michael's murderous rampage takes him from house to house, killing people completely at random. As it turns out, however, the humans of Haddonfield aren't the only ones to be a part of Michael's newest massacre. In a deleted scene which didn't make it to the theatrical cut of the movie, a dog is revealed to have been viciously killed by Michael. Found in the bonus features of the home video release, the scene has also made its way online in its entirety. The scene features actress Andi Matichak as Laurie Strode's granddaughter, Allyson. Taking place shortly after Michael's escape, Allyson is jogging through the streets of Haddonfield when she notices a crowd gathering around a tree. Hanging from a rope is the corpse of a dog, having been killed by Michael and placed on display for everyone to see. Why the masked murderer chose to kill the pet pooch isn't clear, nor is his reasoning behind hanging the body. Perhaps assuming the incident to be a horrible prank, Allyson shrugs it off fairly quickly and continues on. Meanwhile, Michael can be seen watching Allyson passing by from a distance. While horrible, this is far from the first time Michael has killed an animal in a Halloween movie. In fact, he actually kills two dogs in the 1978 original from director John Carpenter. The corpse of one dog is shown in Michael's childhood home, with the implication that the escaped psychopath had been feeding on it. Later, Michael kills a pet dog that's barking at him when he descends upon a home where Annie is babysitting. Additionally, Michael has no problems with killing dogs in some of the other sequels in the series. It's nothing new, but regardless, it's unsettling to see a dog's mangled corpse hanging from a tree in the middle of the day, as shown in the newest movie's deleted scene. Related: Will Jamie Lee Curtis Return as Laurie Strode in Another Halloween Movie? The dog scene isn't the only part of Halloween to be scrapped from the final version. An original ending suggested Laurie Strode died after losing a knife fight with Michael at the climax of the movie. Concerns about this ending leaving viewers unsatisfied led to reshoots, which ensured Laurie clearly survived at the movie's end. Additionally, David Gordon Green was also considering an alternate opening which would have retconned the original movie by killing off Dr. Loomis. Sometimes, it's easy to see why certain cut scenes and ideas don't make it into a movie's final cut, and there are no exceptions here. Showing that Michael is just as quick to kill animals does tease how brutal he really is. Still, the scene with the dog wasn't necessary to move the plot forward, and was really just kind of a bummer. Perhaps it's best left on the cutting room floor. You can see many more deleted scenes on the home video release of Halloween, and you can watch the one with the dog below. This comes from Gizmodo.